A fitting end to the summer was a family trip to Europe, something that I had been looking forward to for quite some time. The plan was to begin the trip in Iceland, and visit Denmark and Sweden after, in that order, and I couldn't have been more excited. This was only my second time visiting Europe, the first being a trip to Italy when I was considerably younger. On that trip however, no fishing was done, so I had yet to catch a fish from the continent of Europe. I had grandiose plans of getting as much fishing as I possibly could in a family trip, and was especially optimistic in terms of species hunting because I knew almost every species I would encounter would be new. Little did I know, the first leg of the trip I would find myself allied with an unexpected culinary item... more on that later. Iceland was the first stop, and was also the country we would be spending the majority of our time in. I was glad this was the case, as I vastly prefer the rugged beauty of Iceland over the more urban environment in Copenhagen and Stockholm. Upon arrival, we got into our rental car and started the short journey towards Reykjavik, the capitol city. Along the way, we marveled at the sights of an alien landscape, and eventually stopped at a fault line where the Eurasian and North American tectonic plates meet. Iceland truly is a strange and wondrous place: dark grey volcanic rock covered the terrain, looking like little meteorites. Flashes of green and pink dotted the ground where the small and hardy flora species clutched on to life. In the picture I was standing on the bridge that connected the Eurasian and North American tectonic plates. Pretty neat. After a while, onward we went towards Reykjavik. We had booked a quaint little AirBnB in the Old City, a short walk away from the harbor. When we got settled in, I found myself free and wasted no time getting my gear in preparation to fish the saltwater around the numerous pilings and docks around the harbor. 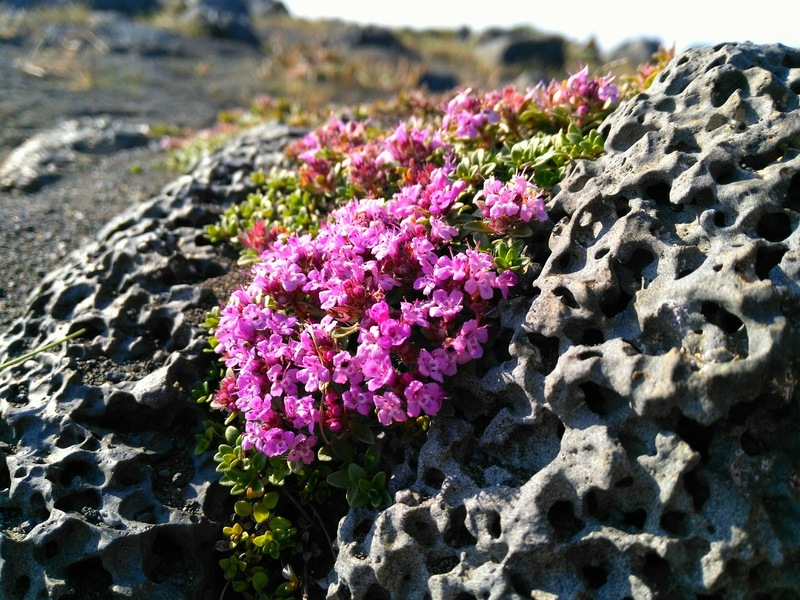 The harbor would be my only opportunity to fish the salt in Iceland, so I was eager to make the most of my time, as Iceland has a very limited selection of freshwater fish species. The first issue was bait. It seems as if the only recreational anglers on the island were interested in solely salmonids and fly fishing, so bait was a no show. I paid a visit to the local grocery store however, hoping to find some raw seafood, but it was processed and expensive. Instead, I picked up a thick pack of cheap bacon. I had watched a video some time ago in which the guy catches a ton of fluke using bacon strips on jigs for fluke. If summer flounder in the northeast like bacon, I was sure that some variety of cold, salty Icelandic fish would. Besides, after weeks upon weeks of scouting locations and fish, I had a fairly good idea of what I would be targeting, and none were especially picky. The next issue was finding a location to fish. An unfortunate turn of events resulted in my original spot getting blocked by construction, so I was left to wander the harbor in search of a place to fish. I'm not complaining though, because I got to see some pretty cool sights. I passed by the famous landmark Harpa Concert Hall, home to thousands of live performances, including dance, orchestras, operas, and music festivals. And I decided it was a good place to fish. I didn't expect anything large, so I decided to start by probing around with a little 1/16 feather jig. I tipped the jig with a sizable piece of bacon, and opened the bail to let line fall out. I let the line go slack and the monofilament pied up on the water's surface. As the bait dropped in the water column, line would follow, and when the line stopped moving, I would know that the jig had met bottom. Only, on the first drop, the line kept moving for impossibly long. I knew the water wasn't that deep, so I tightened up to see what was going on. When all the slack was gone, I felt a little wiggle, and only then did I realize a fish was attached! 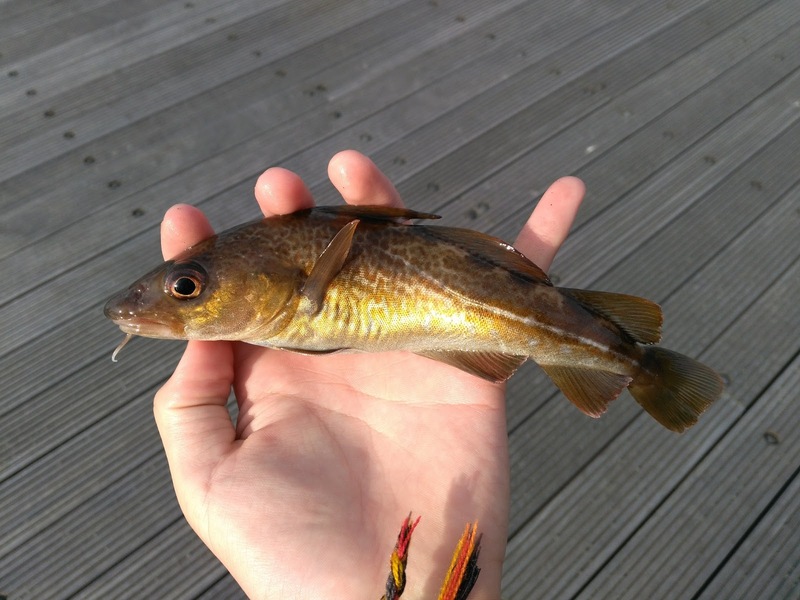 The fight was short and sluggish, and when the fish materialized in the water, I saw it was a small Atlantic cod. I crossed my fingers and hoisted it up, and I had species #105. 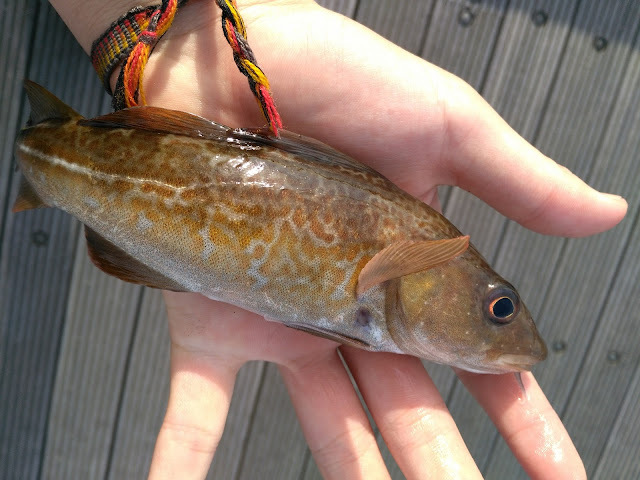 It quickly became evident that there was an abundance of these cookiecutter cod in the area, because dropping a bait down into the dock pilings would result in a hookup almost every drop. After my jig had gotten acquainted with quite a few cod, it was clear that I would have to change my strategy to catch something different. So I dropped down a very small hook with a tiny bit of bacon on a bottom rig, and set it to the side while continuing to fish with the jig. Every now and then, I would get taps on the small hook, only to lift the rod up and feel pressure for barely a moment before feeling nothing on the line. This occurred for a couple of times, before finally, the hook stuck and I reeled up what felt like dead weight. 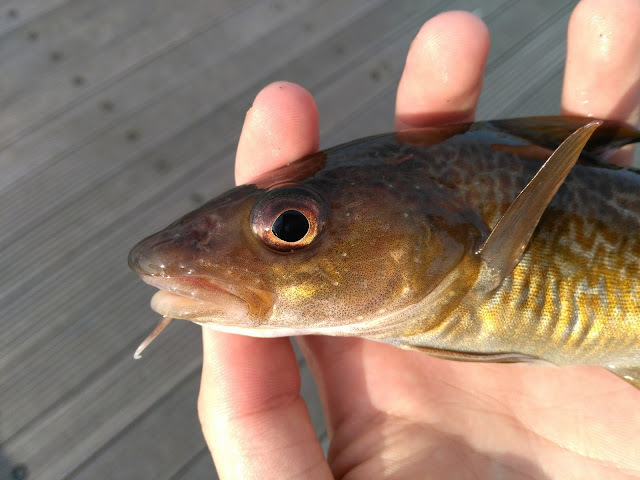 When the fish neared the surface, I saw why: the mouth was huge, and I realized that I had just been pulling the hook straight out of the fish's mouth the entire time. Since it worked last time, I again crossed my fingers and hoisted my line up onto the pier and thus had species #106, the shorthorn sculpin. This was a species I'd hoped I would encounter. Sculpins are an incredibly interesting and diverse group of fishes, not to mention aggressive. This was my second saltwater sculpin species: the first being the Pacific staghorn sculpin from Washington state back in 2014. More sculpin ensued, and it quickly became clear that they were prolific on the harbor floor. Although the sculpins' mottling and striped fins were eye-catching, I needed to turn my attention elsewhere if I was to have any hopes of catching more new species. Through thorough investigation, I learned that there were a couple of flatfish species around the area. Unfortunately, every time I sent out a stationary bottom rig, the sculpin would reach it too fast, way before any other fish could have a chance at taking the bait. To this I gave a good deal of thought, as I needed to come up with a different approach, one that presented a moving bait that would weed out some of the sculpins. The fish I would be targeting would be small, for sure, so any larger lures would be out of the question. I ended up borrowing a page out a the Northeastern fluke anglers handbook. The idea is to use a three way rig, with a heavy bucktail jig on the outward line, followed by a longer length of line with a teaser lure or smaller jig. The big lure would fall fast and kick up sand on the retrieve, attracting the attention of flatfish. The flatfish could either bite the bucktail, if they were feeling aggressive, or they could see the teaser coming a few feet back and take that instead. Since the rig needed to be downsized, instead of a bucktail I used a small bank sinker, and instead of a teaser I put on a tiny hook and a small strip of bacon. I cast it out, making sure to bump the weight on the bottom on the retrieve. Not three casts in, I felt a hard hit and was greeted by something that fought much harder than the sculpin and the cod. It was what I was looking for, a common dab and species #107. The tactic proved killer for the dabs. Using it, I only caught dabs and caught zero sculpin or cod. Changing tactics can pay off when targeting even similar species in the same environment. I would end the session with three new species, a solid start, but I knew there were more to be caught. The next morning, I went out early and tried a different location, and was greeted by the usual three fishes. However, I observed small, codlike fishes swimming in a slight current caused by an outlet on a pier wall. I had seen similar fishes, but they were swimming in schools and moving too fast to target effectively. This situation, however, presented an opportunity where the fish would remain stationary. I suspected the fish were simply juvenile Atlantic cod, but I decided to give it a crack anyways. Putting a tiny piece of bacon on a size 16 hook under a tiny float, I lobbed out a cast into the current and was pleasantly surprised when the fish were quite aggressive. They did have the tendency to spit the bait, however, so it took a couple tries before I actually hooked one. I brought the fish in, and immediately recognized that it was not a cod. Rather, it shone a turquoise color, which confused me. Later, I realized that this was a juvenile coalfish, and species #108. 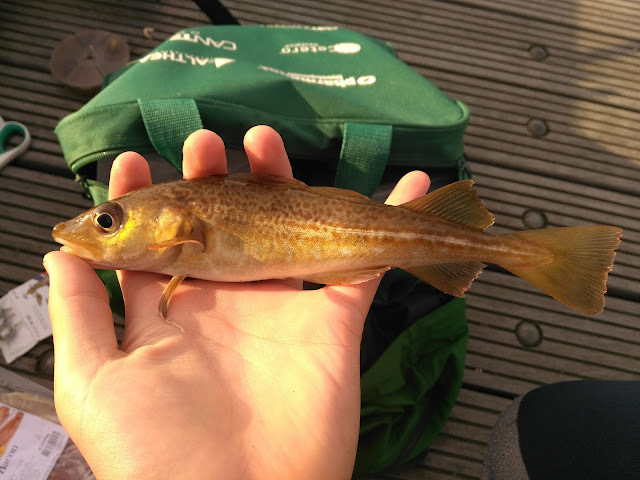 Coalfish (Pollachius virens) is known as pollock in the States, but in Europe, the common name pollock refers to a separate species of the same genus. The coalfish would end my saltwater fishing in Iceland, but thankfully freshwater provided me with some new targets, though limited. 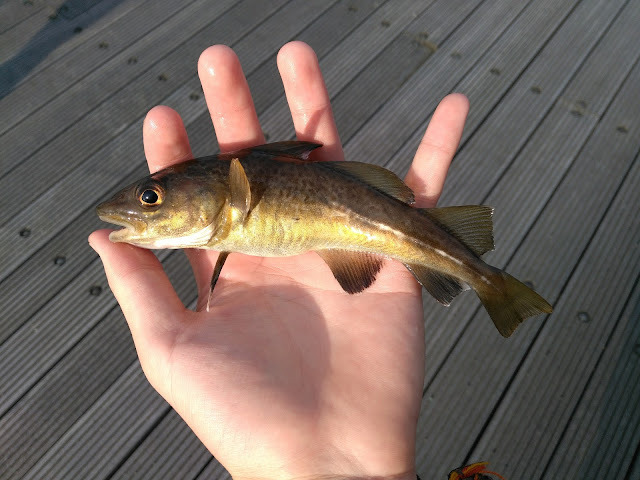 Walking through a city park in the middle of Reykjavik, I saw some small fish scuttling about in the shallow, weedy water of a pond, and immediately recognized them as three-spined stickleback, which sounds a lot more difficult than it was, considering there are only 12 species of freshwater fish on the island, and one stickleback species. Unfortunately I was without anything to catch them with, but since the place we were staying was less than a mile away, I ran back and grabbed the necessary supplies, then ran back to the pond. It was fairly urban, after all, and I was unsure of whether or not fishing was allowed, so I settled in a small corner sheltered from the wind with a little drainage pipe. The stickleback were aggressive, and a little strand of bacon fat was all it took to convince them. Species #109 was in the books. When they lock out their spines like this, you can prop them up like a tripod. A catch of note: this is my smallest catch ever, edging out my previous smallest, an eastern mosquitofish from Florida. The three-spined stickleback would conclude my endeavors in Reykjavik, but a wild goose chase lay ahead in the slightly more wild parts of Iceland.